It’s been more than two years since I first ordered from the Zingerman’s website. In that time a variety of culinary oddities and delights have crossed my kitchen counter; salamis, real fruit juice gummi treats, coffees, peppercorns, bacon, bread, olive oil, teas, I could keep going but I’m afraid I’d list the bulk of their catalogue. When I saw Zingerman’s at the 2009 NASFT Fancy Foods show in New York, I thought that would be the closest I’d get to the actual deli. With little to no reason to visit Michigan, making the rounds of the Zingerman’s shops was tucked away in the back of my mind. Having made myself content to order religiously from the website, I recently found myself in an interesting situation. My good friend, Jon, was getting married to the love of his love, Stephanie. With Stephanie hailing from Northwest Ohio, the wedding would be in Toledo. Immediately the gears in my mind began to turn. I knew that Toledo had been the subject of a border war for Michigan and Ohio for years, so I looked to see just how close Toledo was to Ann Arbor. Seeing the drive was less than 50 miles, I knew where I was going the day after the wedding. Fast forward to Sunday, it was the day after Jon and Stephanie’s wedding. Everyone was packing up for the drive or the flight home while I trying to motivate Bill to move. Eventually, I got Bill to wake up, shower and pack, and we were on the road to Ann Arbor a little after noon. Pulling into the roadhouse, it was hard to miss the line out the door. Thankfully, after putting down a name, the drive thru trailer was able to provide a few warm beverages. After a short 20 minute wait, we were shown to a table and were left with a challenge, trying to figure out what we wanted from the expansive menu. It took us a while to narrow down the choices, but eventually Bill and I had our minds sort of made up. I knew that I had to start with the Roadhouse Corn Dogs. 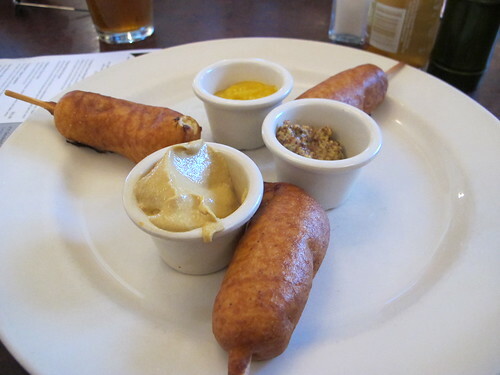 Who doesn’t like a good corn dog, especially corn dogs made with Kosher, all-beef hot dogs and Anson Mills corn meal? Actually, I wasn’t too impressed with these at all. 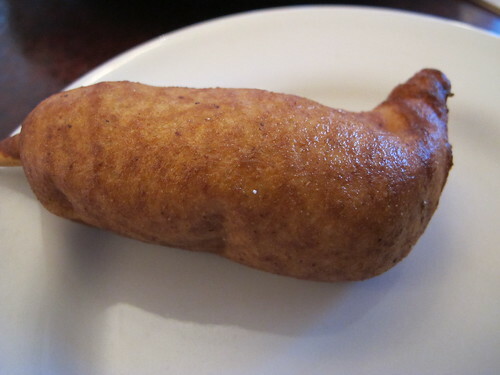 Yes, there was a delicious, juicy hot dog on the inside but the rest of the corn dog was doughy and soggy. The choice of three types of mustard was nice, but I would have preferred a crispy shell to compliment the beef hot dog. 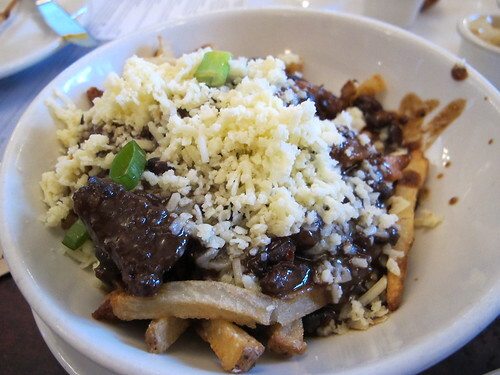 Bill’s choice for an appetizer was an order of the Chili & Cheddar Fries. When the chili cheese fries are hand cut, twice fried fries smothered in ancho chuck chili and topped with 2 year raw cheddar, who am I to argue? Right away I was impressed with the smoky, earthy taste of the chili and the big chunks of tender chuck, but not so impressed with the beans. I realized I was a long way from Texas and the South but I’ll never understand beans in chili. Another oddity was the cheese. I love the idea of using such a high quality, tasty cheese, but it seemed overkill for these fries. Not to mention, it seemed pretty reluctant to melt. Moving away from the appetizers and into the realm of the entrees, Bill and I were trying to figure out how to split everything when our waiter intervened. His suggestion was for him to split everything and bring it on separate plates. I’ve never had a waiter make this suggestion and I was more than happy to accept his offer, starting with the Roadhouse Macaroni & Cheese. Made with a cream sauce, artisanal macaroni, and more of that 2 year cheddar, I can see why Food Network labeled this as the “Best Comfort Food in America”. 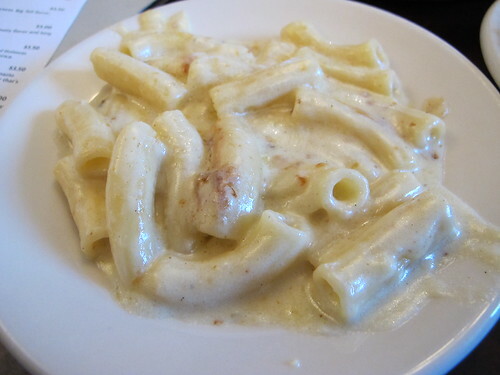 It really was delicious and with a liberal addition of pepper, just what I was hoping for, especially that macaroni. That being said, I still wondered if we would have been better off ordering the Memphis Macaroni, essentially Neely’s BBQ Spaghetti but with Macaroni and Parmesan. 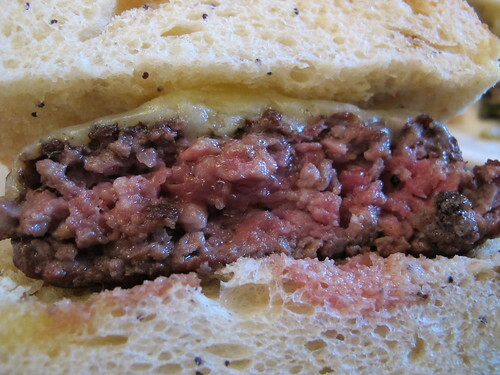 Since I’m always on the hunt for a quality burger, trying one of the Zingerman’s burgers was a forgone conclusion. Eventually we decided on the Cornman Farms Burger. 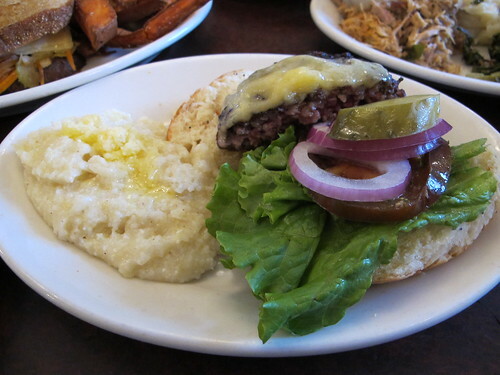 Yes that’s a side of grits next to the grass-fed, dry-aged, grilled burger. 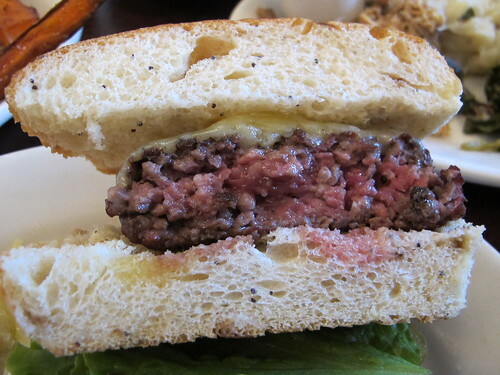 This burger was smoky, cooked t0 a perfect medium-rare, and had the look of a loosely handled patty. As is often the case, there was a choice of cheese with this burger, but not your average choices of American, Swiss, or cheddar. Here there were 10 to choose from and this burger was topped with 1-Derful-1-Year Grafton Cheddar, a great recommendation from our waiter. There was only one real problem, where was the Applewood smoked bacon? Between the two of us, we decided that the bacon was hidden under the cheese leaving it relatively obscured both visually and taste wise. Regardless, this was a fine bacon cheeseburger. All quality burger components aside, I couldn’t forget about the grits. Described as South Carolina corn grits with more Vermont cheddar, these grits were creamy, a little too creamy. 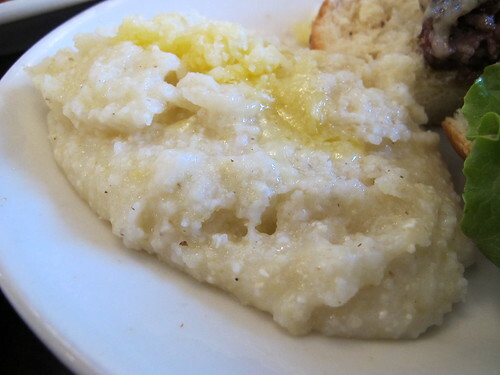 I prefer my grits to be a little more coarsely ground, but not too shabby. When you pull into the Roadhouse parking lot, it’s hard to miss the smell of hardwood smoke. Even before we left a name with the hostess, Bill and I knew we had to try some of the Zingerman’s bbq. Eschewing the pork ribs and beef, we went for an order of the BBQ Pork Entrée. 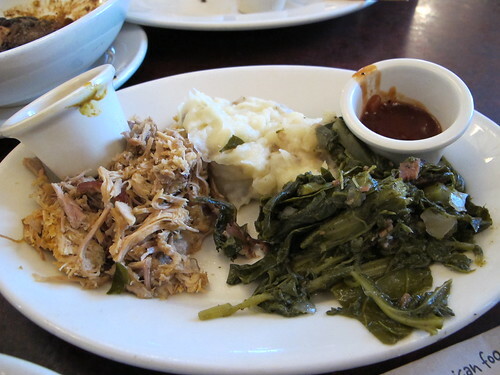 This is the result of a whole hog bbq and it’s served with mashed potatoes and greens. I drove 1000 miles north to get a taste of home. 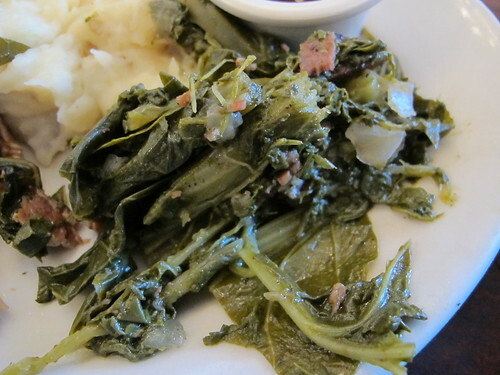 Speaking of home, these greens are actually called Southern-style braised greens and they do a pretty decent job at it. Thankfully the greens aren’t completely cooked to death and there is a nice peppery taste, but what’s missing is the key Southern ingredient, pork. 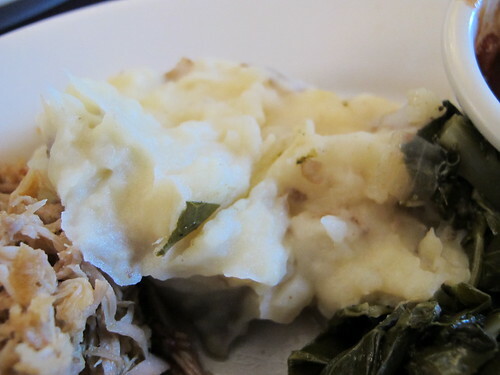 The mashed potatoes were creamy, lumpy and pretty damn good. Of course the real question is how does the pork stack up? 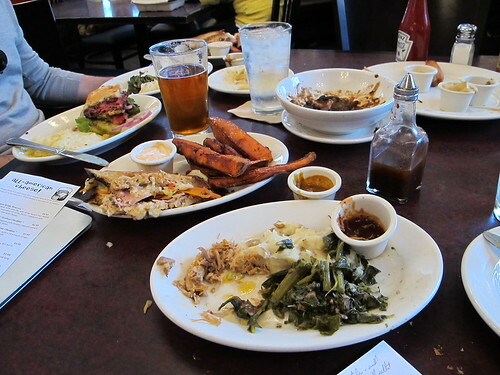 Zingerman’s Roadhouse did a fine job with this pig. Each piece was smoky but with a peppery punch from the rub. Even better, there wasn’t a chalky piece to be found; this pork was very well cooked and could stand on its own. 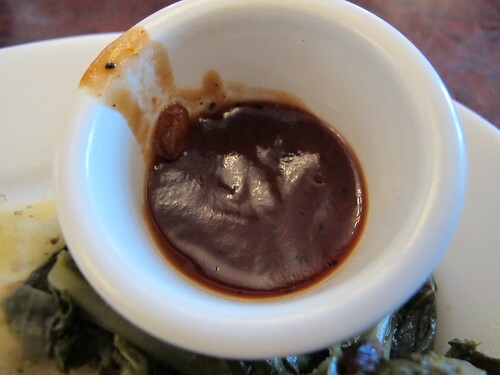 Annoyingly, Zingerman’s decides to equip each plate of BBQ pork with a choice of three sauces, each one representing three major regions of bbq, Memphis, South Carolina, and Eastern North Carolina. Based on geography, I started with the Memphis first. 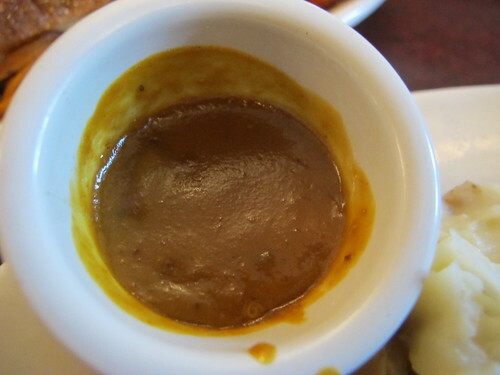 This was your typical sweet sauce and actually not bad. The South Carolina mustard sauce was next and while there was a nice combination of mustard and spice, this sauce really brought out the chalky dryness of the pork. 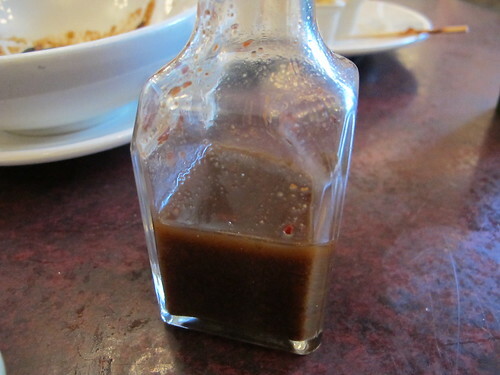 Last was the Eastern North Carolina vinegar bbq sauce and this one was my far and away favorite. 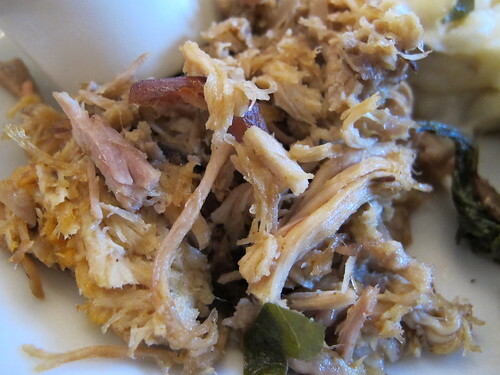 Each shot of vinegar brought a new level of spice to the pork and made it simply delicious. One would think that would be enough for two men, but no, there was one more thing left to try, the Roadhouse Reuben. 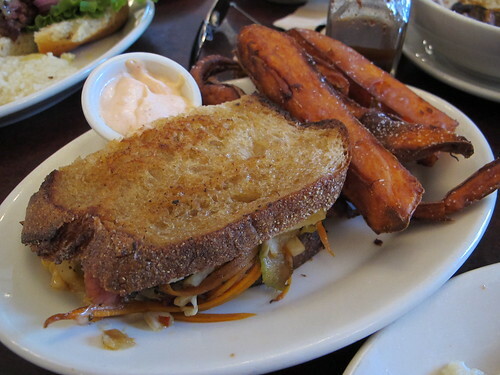 It’s a deviation from your traditional Reuben. There’s no mention of pastrami or corned beef, instead this Reuben is made with Arkansas peppered ham then topped with Swiss cheese, Alabama Hot Slaw, and Russian dressing on Roadhouse Rye. I was a little put off by the carrots in the sandwich, but I could honestly eat that peppered ham every day just for that peppery rind. 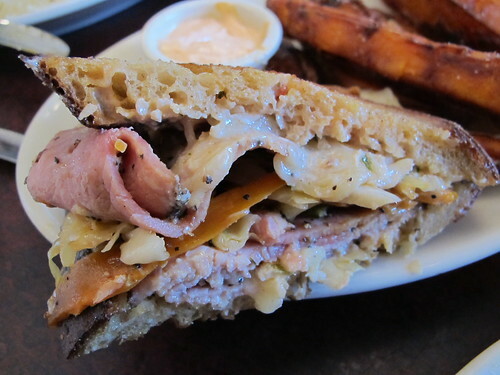 I don’t know if I’d even call this a Reuben, but with that ham, it’s a dynamite sandwich. Needless to say there were a lot of leftovers. Despite our best efforts, Bill and I had simply ordered too much, but I’m fine with that. I’ve been waiting for years to eat at a Zingerman’s restaurant and I wasn’t about to squander that opportunity with “restraint”. 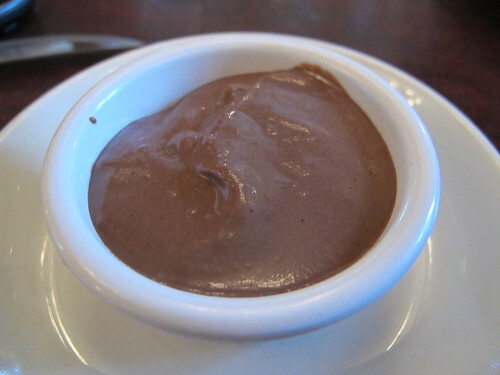 Apparently our waiter thought we needed a little something extra, chocolate pudding. I don’t even really like pudding but this was delicious. It was everything you could want in a pudding, creamy, smooth, name a positive pudding adjective and it was there. I suppose the immediate question is, was it worth the trip and/or wait? That’s a hard question to answer. I haven’t had much experience with food prepared by Zingerman’s, outside of the bread, but I was pretty pleased with what we ordered. It wasn’t the life changing, ethereal experience that I was halfway hoping for, but so few things are. What I did find was an expansive menu, high quality ingredients, well prepared food and a fantastic wait staff. When our waiter caught wind of us visiting other Zingerman’s locations, he got us a map, gave us directions, told us whom to talk to and even signed our check list for the Zingerman’s tour. What ensued was a whirlwind tour of the remaining four of the five Zingerman’s locations, the deli, the bakery, the creamery, and the roaster. It may have been my first time in Ann Arbor and at Zingerman’s, but I made it count. I love Zingerman's Deli, but I just can't see the appeal of the Roadhouse. All it's really doing is selling upscale (read "more expensive") versions of dishes available at other eateries around town. It's just not worth the extra bucks. I am very glad that I have been a customer of all things Zingerman's since they started the deli, I love very single one of their busineses and the community service that they do all year round. Come on back and see us anytime. 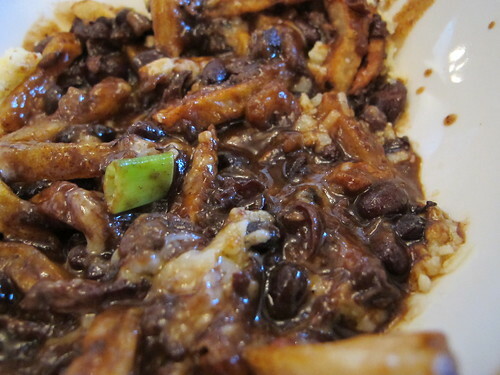 If I can only go to one of the Zingerman's establishments, which one should I go to? the Deli or the roadhouse? If I could only go to one, I'd probably go to the deli just to see where it all started.